I found myself doing the strangest thing in the yard the other day: planting flowers. A few years ago, I could not have predicted this day would come. Flowers were for girls. Or maybe for old men who like to prune roses. But no — I’ve since become enlightened: Flowers are for bees. One day a few Marches ago, my broccoli plants were bolting, going to flower as the spring weather warmed. This was when I customarily cut them down, to make space for new vegetables. I considered myself a very practical gardener. I only grew edible plants, and within my garden I only gave space to plants that were providing for me, so the flowering broccoli had to go. But as I thought to cut the broccoli down, I saw how many bees had arrived and were buzzing all over the stalks of yellow blooms. And I thought again. I thought about what flowers meant to bees; they are providers of nectar (carbohydrates) and pollen (proteins and fats). Flowers are food for bees. 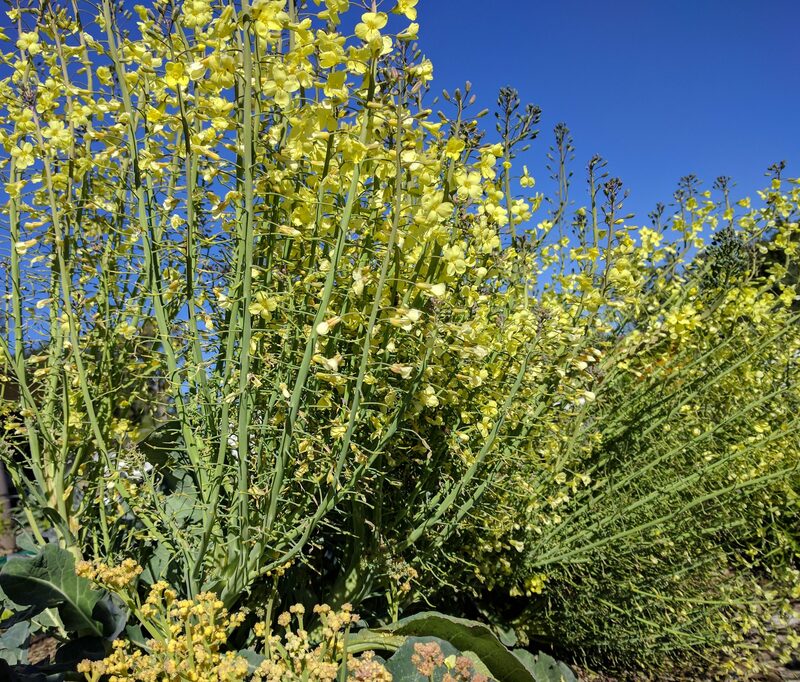 It so happened that these flowering broccoli plants were twenty feet from a pair of avocado trees I’d recently planted, and in March these trees were also blooming. But whereas the broccoli flowers had bees bumping into one another in a feeding frenzy, there was only a lone bee visiting the nearby avocado flowers every once in a while. Avocado flowers aren’t particularly tasty to bees. But I needed those bees to be working the avocado flowers because without them I would have no avocados. 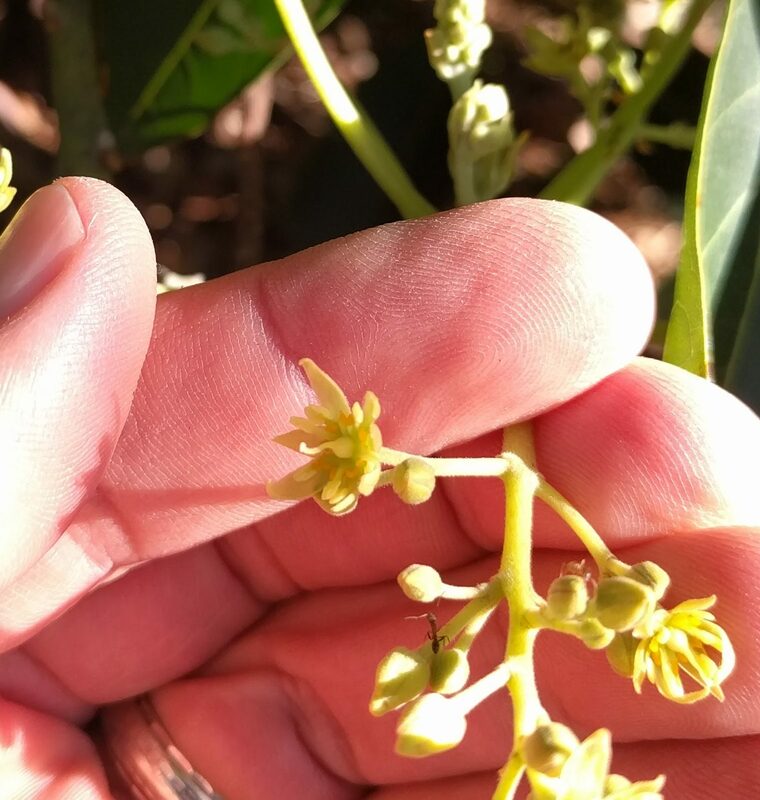 For avocado flowers to be pollinated and grow into fruit, they need pollen to be transfered onto the stigma, the little stick in the center of the flower. So I cut a few stalks of broccoli flowers off and laid them on the ground beneath the avocado trees, trying to lure the bees that direction. It kind of worked. A few bees visited the migrant broccoli flowers before they dried out. 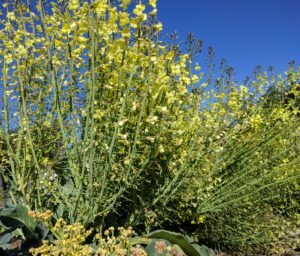 I continued to cut and move a few broccoli flower stalks each morning until the broccoli blooms were all done, having turned into seed pods. But in the end the lesson was clear: I needed bees, bees needed flowers, so I needed flowers. Gordon Frankie likes to ask, “Who did all the pollinating before the honey bees came from Europe in 1853?” Honey bees were brought to America back then, but they are only one kind of bee, Apis mellifera. Yet there are approximately 20,000 bee species across the globe, and we have 1,600 different species of bees native to California alone. Attending a lecture by Frankie last summer opened up my eyes to the world of bees beyond honey bees. The very day after the lecture, I spotted an Ultra Green Sweat Bee in my garden for the first time. This is one of the most common native bees in California, only I had never noticed it before. And if I’d ever seen it, I’d probably ignored it thinking it was a funny green fly. 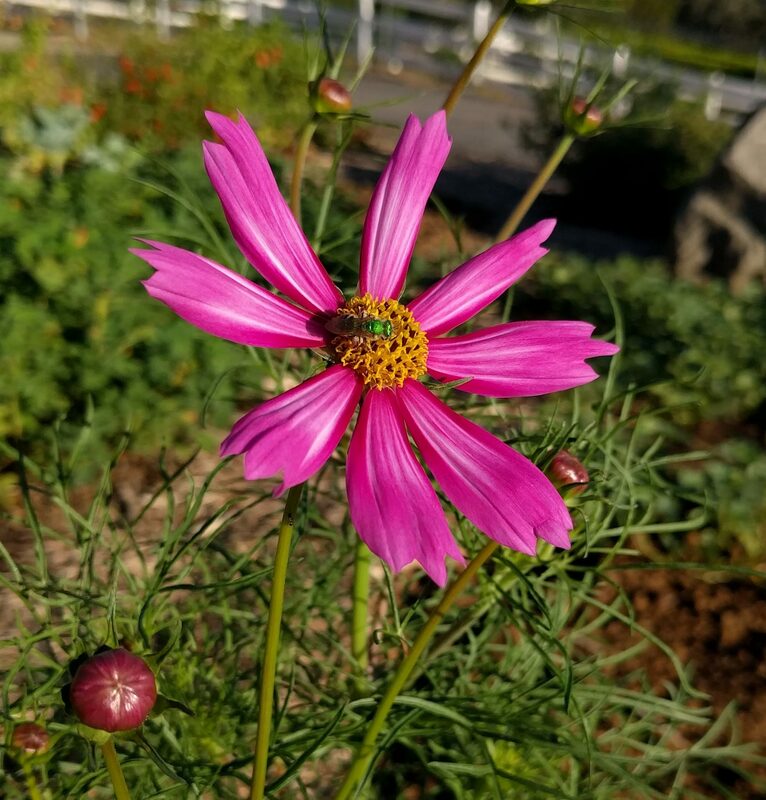 Ultra Green Sweat Bee, Agapostemon texanus, on cosmos flower. What is a bee, anyway? Early in Frankie’s talk, I raised my hand to ask that very question. I was embarrassed to realize that I didn’t know the difference between a bee and a fly, or a wasp for that matter. Frankie explained that bees are flying insects that have a close relationship with flowers. That’s the main way in which they’re different from flies. He also noted that bees are vegetarians whereas wasps are carnivores. Gordon Frankie is a professor at UC Berkeley where he also directs the Urban Bee Lab. 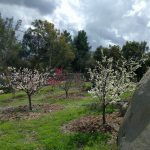 See the Bee Lab’s website here. He’s been studying the habits of native bees for many years. 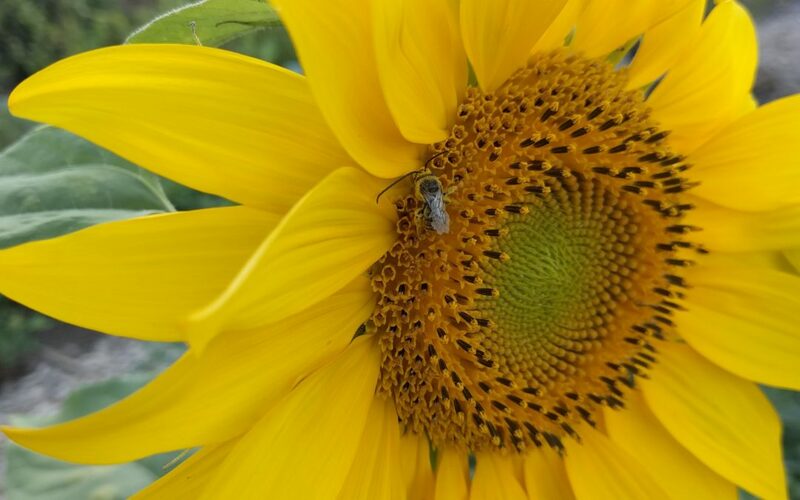 He mentioned innumerable fascinating things about native bees — 70% nest in the ground, so don’t mulch thickly everywhere; they get all of their water from nectar — but one thing really caught my attention. He’d noticed that small carpenter bees of the genus Ceratina visit avocado flowers often and may be important pollinators of avocados. Frankie mentioned to me that he has seen species of two other groups of native bees, Halictus and Andrenid, also visiting avocado flowers often, and in fact just today I saw a kind of Halictus bee on the flowers of my Pinkerton avocado tree. They’re so small and fast that they’re easy to miss, unlike the big and loud European honey bees. I still appreciate honey bees. But since learning of the hundreds of other bees that are around, I’ve become much more interested in identifying and attracting them to my garden. Honey bee digging into one of my Blenheim apricot flowers last March. So I find myself planting flowers these days. Which flowers am I planting? I do remain a practical gardener, and a frugal one at that. 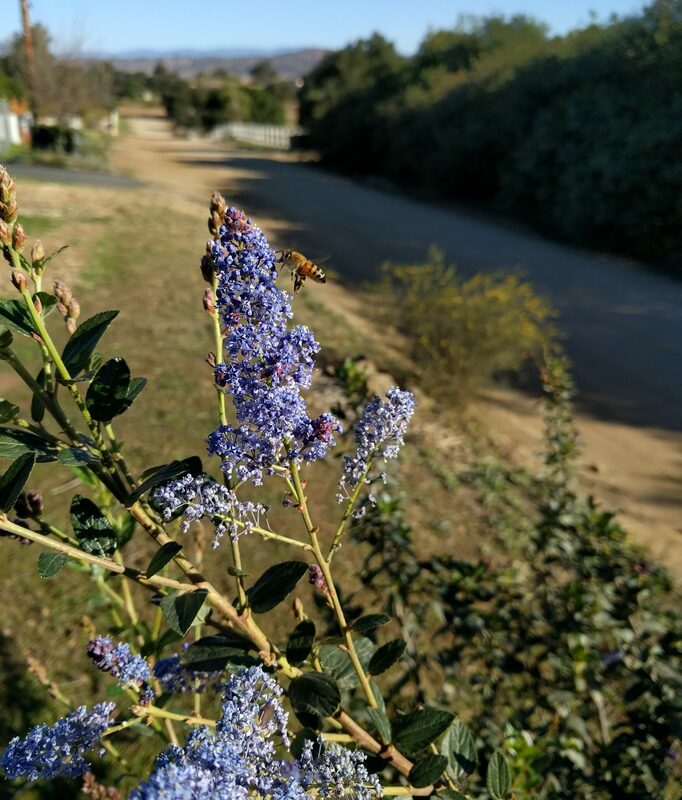 So I prefer native flowering plants, which don’t require irrigation, such as this Ceanothus or California Lilac, a plant which grows wild in my neighborhood. 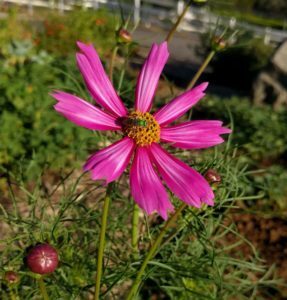 But the other day I was planting a mix of native and non-natives — sunflowers and cosmos and poppies — because I’ve noticed in years past that bees love those flowers. Yes, I’ve actually been growing more and more flowering plants in my yard for the past few years now. I let cilantro self-sow near some avocado trees and I’ve seen different types of bees and other insects enjoy their white flowers (on left). On the right are poppies that also self-sow. They come up every year and take care of themselves. Both cilantro and poppies get no irrigation. 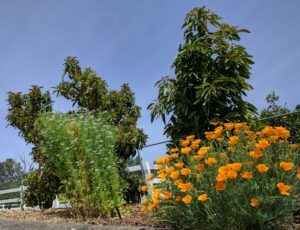 I have also increased the number of flowers in my yard by simply allowing more of my vegetables to live out their lives and bloom just as I did with the broccoli. As much as my space and harvest needs allow, I now always let the following vegetables or herbs flower because I’ve noticed that bees (not just honey bees) love them: lettuce, basil, oregano, cilantro, carrots, onions. 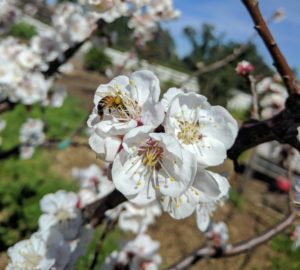 Frankie’s Urban Bee Lab has put together a nice list of Best Bee Plants for California here. And it is talking about European and Californian bees both. Frankie wrote a book with a few colleagues titled, “California Bees and Blooms,” which I highly recommend. It also describes plants that bees love, plus profiles a number of the most common native bees we might see in our gardens. Will my plants be more fruitful in years to come as I provide for the bees and they provide for me? Interesting to know more about bees. I just hope I don’t have them back this year eating my peaches!!! Stop growing such sweet peaches! I am enjoying your blogs. 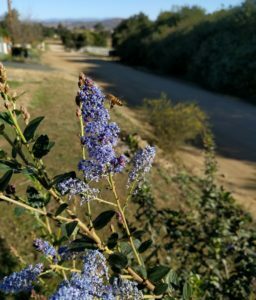 We are looking to add flowering plants near avocado trees but we do not have the space to include Ceanothus or California Lilac. Any recommendations for bee plants that would work in a 2×2-foot space along a fence? The area has filtered light and shade. I have also downloaded the urban bee list. Thanks! I have cilantro going in a full-sun spot as well as a partly shaded spot, and it does well in both. 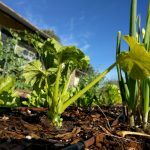 You could buy some cilantro seedlings in a small pot at a nursery right now (February), plant it by your avocado trees, and then let it go to flower, which will probably happen starting next month. If you want, you could also let the seeds dry on the plant and then leave it be or break it up and leave it on the ground. Next winter, you’ll have a bunch of new cilantro plants emerge after the first rains and the process will repeat itself. This is what I’ve done for a number of years. I’m sorry but I can’t think of any other flowering plants that I know for sure will do well in partial shade and that I’ve seen attract bees. Many other flowering plants that I grow seem to like more sun or take up more space. I love cilantro and weeds do well in this area :), perhaps the cilantro will do fine. 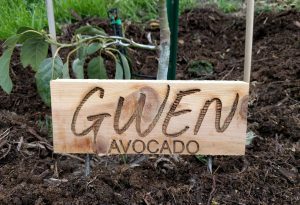 Our primary avocado tree, a Sir Prize, was already in the grown at the time we purchased of our house. The Sir Prize has flowers growing all over. 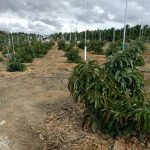 The B pollinator avocado tree (type unknown-already installed) has zero flowers growing. I thought it might help to add flowering plants near the Sir Prize tree. 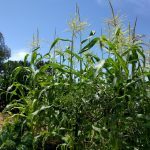 It certainly will only help if you have flowering plants near the SirPrize. That’s a variety that many people have found to be lower in productivity than some other varieties. I know that my SirPrize supports that generalization. Then again, maybe I need to plant more flowers nearby! I’ve read that Sir Prize blooms significantly earlier than Hass, and most other varieties. I wonder if Sir Prize is not being cross pollinated because it’s bloom type doesn’t overlap (enough) with other avocados? Stewart (Stuart?) is the only other early blooming variety that I’ve heard of, and it is type A (when grown inland at least) while Sir Prize is type B, so a Sir Prize might produce more with a Stewart nearby. Greg, do you have a Stewart also? It might be an interesting experiment. SirPrize does peak in its bloom earlier than Hass in my yard. I do have a Stewart, but it’s very young and so can’t provide much pollen. But I have a Pinkerton that is not far from the SirPrize, and it flowers earlier than Hass too. Pinkerton might be the best companion in terms of overlapping bloom of an opposite type for SirPrize. I’m actually already in the process of fiddling with my SirPrize and grafting in another variety or two, so maybe I’ll see how Pinkerton does in there. Thanks for the ideas, Conrad. Really enjoyed this one Greg!